1. Heat oven to 205°C. Combine water and butter in 2-quart saucepan. Cook over medium heat 4-7 minutes or until mixture comes to a full boil. 2. Reduce heat to low; stir in flour until mixture leaves sides of pan and forms a ball. Remove from heat. Beat in 1 egg at a time until mixture is smooth. Drop dough by 1/4 cupfuls, 8cm apart, onto ungreased baking sheet. Bake 35-40 minutes or until puffed and golden brown. Pierce each puff gently with fork to allow steam to escape. Cool completely. 3. Prepare pudding mix, using 1 1/4 cups milk, as directed on package. After pudding is set, gently stir in whipped cream. Cover; refrigerate up to 4 hours or until serving time. 4. 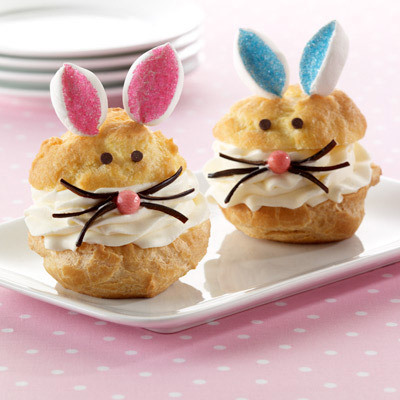 Create bunnies by cutting off cream puff tops. Cut large marshmallows crosswise into 3 pieces. Dip cut-sides into decorator sugar for ears. Using toothpicks, attach sugared marshmallows into top of cream puff for ears. Use melted candy coating to attach chocolate chips for eyes. 5. Fill bottom half of cream puff with 1/3 cup filling just before serving. Press licorice strips for whiskers and pink candies for nose into filling. Place decorated cream puff top over filling. Sprinkle with powdered sugar, if desired. 6. Recipe Tips: Remove toothpicks from ears before serving. In place of toothpicks, bunny ears can also be attached to cream puff using additional melted candy coating. Hold marshmallow ears in place a few seconds until set.